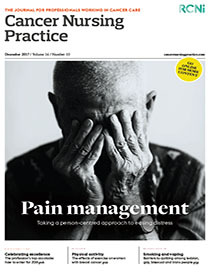 The Managing Advanced Cancer Pain Together (MACPT) group is a team of European experts in pain management who recognise that, despite the great advances in cancer treatment and care, many people living with advanced cancer still receive suboptimal pain management, leading to distress and suffering. The MACPT group takes a person-centred approach to understanding and addressing all aspects of people’s pain, and believes that pain management can be improved. Building on international guidance and expert opinion, the group, working with patients with advanced cancer, has developed clinical based and easy to use MACPT guidance to support those working in the field. The guidance includes the newly developed MACPT conversation tool, to help people with cancer, and those caring for them, to talk about the hidden aspects of pain. The guidance and tool are available in English, French and German, and will be translated into other languages. This article discusses management of cancer pain and describes how to use the conversation tool.